This online calculator will compute and plot the distance and midpoint for two points in two dimensions. The calculator will generate a step-by-step explanation on how to obtain the results. 1. This calculator will return the result representing the midpoint and distance between two points. 2. You can enter either integers (10), decimal numbers(10.12) or fractions(10/3). How to find distance between two points ? 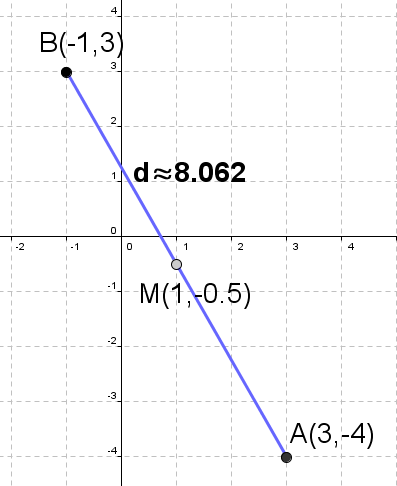 Note: use this calculator to find distance and draw graph. How to find midpoint of line segment ? Find midpoint of a segment with endpoints $A(3, -4)$ and $B(-1, 3)$.